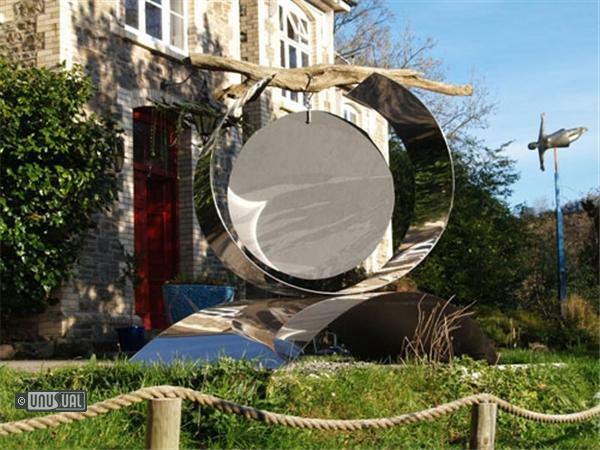 Broomhill Sculpture Park has established itself over the past twelve years as one of Devon’s leading art centres, housing the largest permanent collection of pieces in the South West of England. 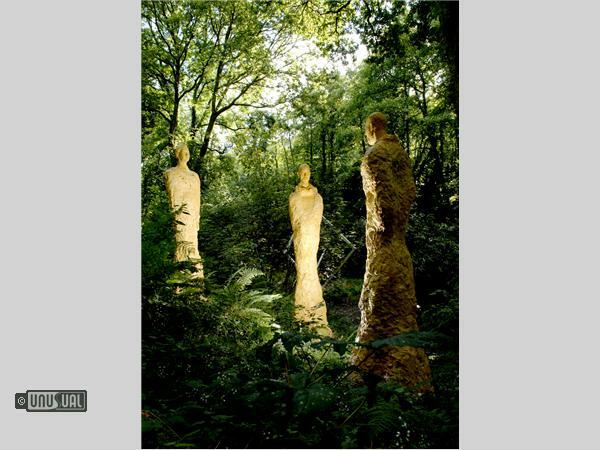 The growing collection is set out along a sculpture trail, through the formal gardens and woodland walk, down into the valley and beside the Broomhill pond and river. Enjoy works by artists of international reputation such as Alain Kurylo, Laury Dizengremel, Mike Roles, Pasie Collective, Greta Berlin, Ronald A. Westerhuis and David Kemp. The collection includes works by other important international sculptors and by emerging artists. 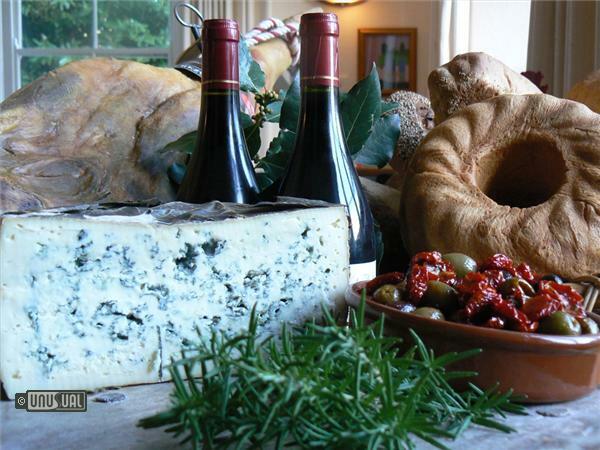 Broomhill is a late Victorian hotel with six light and airy bedrooms, located in North Devon, with an award-winning restaurant, contemporary art gallery and sculpture park, displaying hundreds of fascinating sculptures. All rooms are en suite (shower, washbasin and toilet) with tea and coffee-making facilities, colour television and telephone. Most rooms overlook the Sculpture Garden. Hotel guests have FREE admission to the Sculpture Garden. The starting point for my love of art and my passion for collecting paintings and sculpture was a visit to a 1977 touring exhibition of original contemporary prints in Tilburg. There I made the decision to buy a lithograph by Pierre van Soest, an impression of a painting by Jan van Eyck of 'Giovanni Arnolfini and His Wife'. Living in the south of the Netherlands, modern art was not widely available. In the eighties, only a few galleries existed there; the scene was Amsterdam. Luckily I lived close to Eindhoven where the Van Abbemuseum housed one of the best European contemporary art collections. That collection and their exhibition programme developed my personal interest and opened my eyes to the world of art. Over the years this encouraged me to visit many international collections and exhibitions in Europe and the United States. 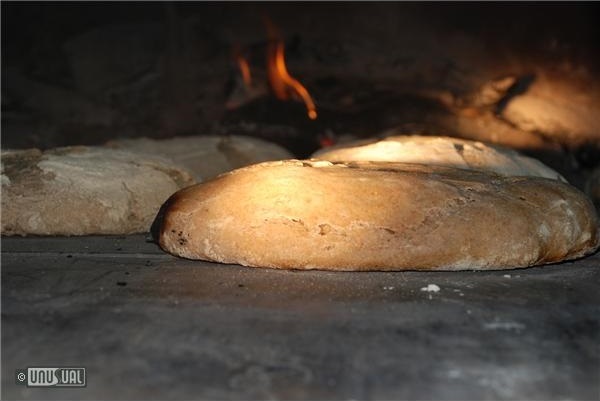 Running a bakery business meant that my budget was limited, but often I made a deal with a gallery or the artist and paid for the work in small amounts. Once one piece was paid for, the excitement was in finding the next. In 1991, I met the artist Marlies Vonk and her partner Ton van Loenen. They came back from the States and set up a temporary studio space in an industrial annexe in my Dutch home. It was to be the beginning of a strong friendship. Whilst Marlies was working in the studio, my wife Aniet and I started discussing how we would put our 250 square metre studio space into good future use: we loved the idea of creating a gallery - a stage for young artists. Given that we were both working hard at our bakery business and had plans for a family in the future, life was hectic enough without introducing a gallery. 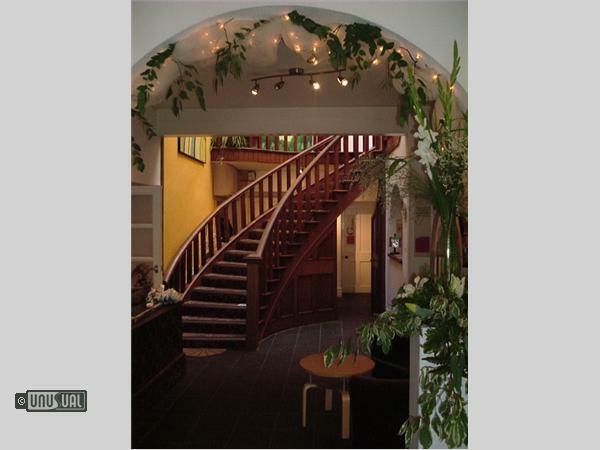 We discussed our plans with Vonk’s manager and partner Ton van Loenen he could understand our hesitancy and offered to help us set up a gallery and develop it during its first years - hence, our gallery: Kunst Kijkhuis Koestraat, was born. Now began a fascinating period of discovery; how to stage exhibitions, to deal with artists, the visitors and the gallery clients. In the summer of 1994, the artist Claire Burke, at that time a student at St Martin’s College of Art, stayed with us in order to care for our six-month-old son, Bob. Claire was from Cornwall, and introduced us to her home county that autumn. We spent fourteen days travelling Devon and Cornwall. It is a time that we look back on with very fond memories. In fact, it was life changing to the extent that we never wanted to leave! We liked the idea of introducing sculpture into our exhibitions but needed a place with an appropriate sized garden. Holland was not an option as so many galleries and sculpture gardens already existed. We decided to concentrate on North Devon as we had fallen in love with its vast landscape and beautiful coastal scenery. Devon attracts five million visitors annually and has both Bristol and London within easy reach. We felt that it was an ideal location in which to establish a sculpture park with the potential for attaining national recognition. After many visits to estate agents and pondering over various ideas, we eventually found Broomhill - then, a rundown hotel - just outside Barnstaple, in the centre of North Devon. It was the perfect size: ten acres of overgrown but potentially very beautiful terraced gardens. The house featured a great ballroom which we could visualise as a fantastic gallery space. What's more, we could build an income around the rooms and restaurant and plough all the profits into developing the sculpture park. Before moving to Broomhill we took time off and decide to travel with our Volkswagen camper and our two little kids to the south of Europe. This trip was an incredible experience and it also inspired us to introduce the Mediterranean style and flavour of cooking at Broomhill , we wanted to explore the flavour of a Moorish cuisine. We also decided that the Slow-food concept and the use of Artisan producers was going to be extremely important in the way that we wanted to operate. The ideas we picked up on our journey formed the basis for our Terra Madre Restaurant. By April 1997, we were ready to move in, but not before spending three hectic months renovating with help from our artist acquaintances, local builders, family and our multi-talented Canadian au-pair Kate. 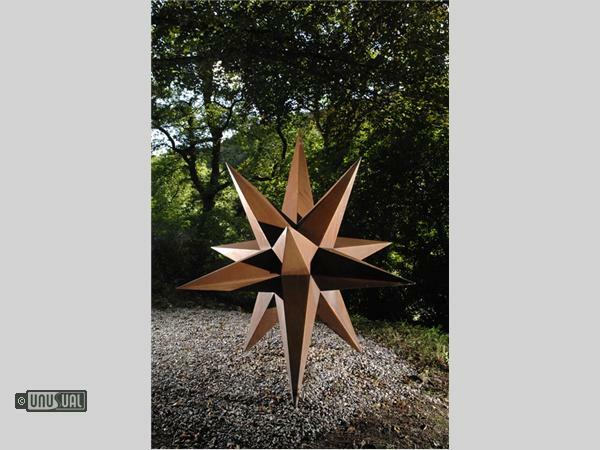 The garden was a huge task in itself: overgrown with woodland and brambles, it was in desperate need of cutting back and clearing to make way for paths, stands and monumental sculptures. By June, the first stage of development was finished. A collection of sculptures had arrived, and the opening, therefore, was planned for mid-June 1997. With an exhibition in the gallery, numerous sculptures in the garden, a band performing on the terrace and 150 invited guests set to enjoy the birth of Broomhill with us: It was a brilliant start to our new life. or the sculpture park, and I felt that our budget was better spent to concentrate on the park. We made the gallery part of the hotel and restaurant, with smaller exhibitions and a display of work from artists involved with the sculpture park. 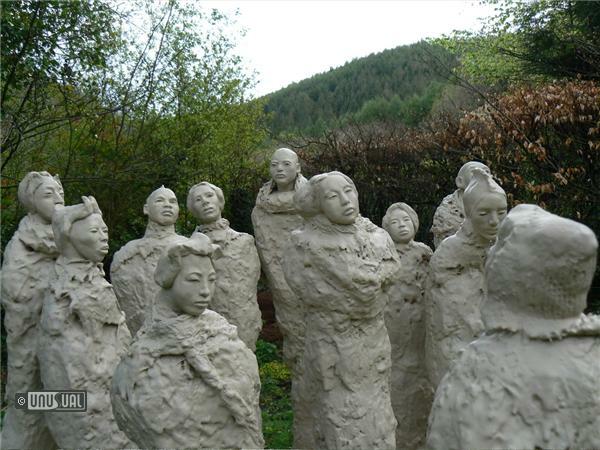 In 2009 we decided to create the Broomhill Art and sculpture foundation CIC. I felt that the recession made opportunities for the arts more difficult and I wanted to create a stage for a national competition; a showcase of new work from emerging artists. Looking back over the last 6 competition years, I didn’t realise what an exciting and energetic new direction this was for Broomhill. I need to thank Helen Blackman for all her input to make it work, for years we worked together as a very close team to make the competition successful. Broomhill is about passion and determination. We have established a wonderful relationship with each and every artist and this has made Broomhill what it is today. Nestling in a gloriously green woodland valley, two miles from Barnstaple, England’s oldest borough and Gold Award winner for the prettiest floral town in Europe, Broomhill is within easy reach of the golden sands of Woolacombe, the beauty and mystery of Exmoor and first class golf courses. Broomhill is the ideal location to experience the best of North Devon. Dramatic, rugged coastline, the award-winning beaches (just 20mins away by car), hike over Exmoor, visit exciting attractions and events or take part in activities near by such as horse-riding, golf and surfing. Discover hundreds of fascinating sculptures in the garden, contemporary art in the gallery and mouth-watering, home-made, organic food and drink in award-winning the restaurant. There’s a whole host of activities for all ages to enjoy!